If I had to pick one bluesman who was the quintessential blues deity that man would be Howling Wolf, or as the IRS knew him, Chester Arthur Burnett. He was named after the President. I don't remember the first time I heard him but he impressed me. He impressed many people with his stentorian gravelly baritone-bass voice that sounded like crushed glass and radiated unrestrained masculinity. Producer Sam Phillips said that Howling Wolf was the literal soul of man who never died while fan and musician Bonnie Raitt talked of the sudden impact that just seeing and hearing Wolf had (from afar) on her lady parts. Howling Wolf stood 6-6 and weighed over 300lbs in his glory days. He received his nickname not just for his unusual howling vocal abilities but because as a child he was quite taken with the Little Red Riding Hood stories he heard. He reminded me of my maternal grandfather. Although it was Howling Wolf's surprisingly expressive, deep and oft sinister voice that most people noticed, he was also a fairly talented harmonica player and decent guitarist. Wolf's voice was such that I imagined that he woke up every morning and gargled with road salt and nitroglycerin. Howling Wolf's primary vocal influences were people like Charley Patton, Son House, Tommy Johnson and Jimmie Rogers. Elmore James and Wolf also had similar vocal styles. 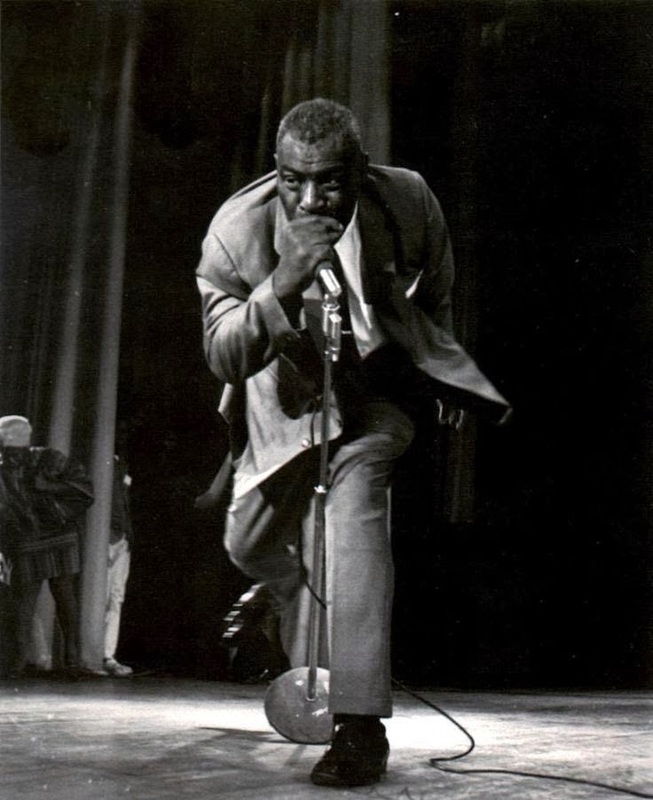 Wolf toured with Robert Johnson and learned harmonica from his brother-in-law, blues giant Sonny Boy Williamson (Rice Miller). So Wolf was literally a blues Founding Father. Wolf's yelps, howls and vocalizations were unique. As Wolf said "I couldn't yodel but I could howl. And I been doing just fine." Howling Wolf was an extremely demanding bandleader who did not suffer fools or glory hounds lightly. Wolf once stopped a show to berate guitarist Hubert Sumlin for mistakes and pedestrian playing. He kicked Sumlin off his stage. Wolf sent Sumlin home, warning him not to return until he could play. Sumlin, who later became Wolf's primary foil and soloist, credited that incident with forcing him to improve. Wolf had no problem putting hands on people if he thought they did him wrong. He once knocked Sumlin's teeth out. 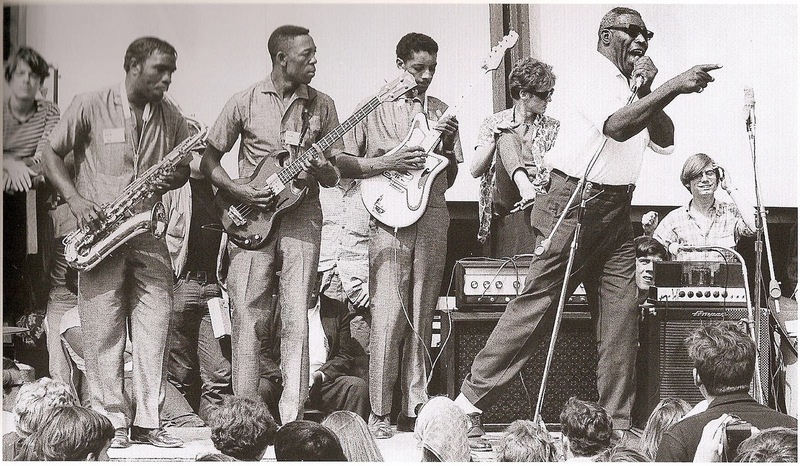 There was one incident when he and fellow giant (literally and figuratively) bluesman Albert King fought. There were rumors about people that Wolf had badly hurt or worse, down south. Because he grew up in horrible poverty and segregation and often worked around people who were drunk, violent or armed, we shouldn't be surprised that Howling Wolf could be a suspicious martinet. It didn't help his outlook on life that his mother had essentially abandoned him after her divorce from Wolf's father. Wolf grew up with a great-uncle who could have been charitably described as violently abusive. Wolf finally ran away to rejoin his father and siblings. But the maternal rejection left lifelong scars. As adults, mother and son had a conflicted relationship.Wolf's mother, a spirituals singer, thought that blues was the devil's music and that her son was going to hell. Wolf was unafraid to tell people, black or white, what he thought. As Vaan Shaw, a blues guitarist whose father worked in Wolf's band said, "He was not necessarily a likable person. If you told him "good morning" he might answer with something like "'Well I don't know how good it is. Let's wait and see"". Working with younger avant garde blues/funk musicians in the late sixties, Wolf told future Miles Davis' guitarist Pete Cosey that "(Cosey) should take all of his pedals and wah-wahs and throw them in Lake Michigan on his way to get his hair cut". Cosey, who had a massive afro, remembered the incident with fondness. Wolf later bluntly described the album he did with Cosey as "dogs***". Generally, musicians who worked with him didn't have problems if they did their job and didn't get on the oft moody Wolf's nerves. Buddy Guy said he never had a cross word with Wolf. Howling Wolf took his music and life seriously. He despised drunks. He was contemptuous of musicians who allowed alcohol to control them. Even his mentors and heroes like Son House could come in for caustic criticism from Wolf for this reason. Although when Wolf left home he was illiterate, he ultimately remedied that condition. He even briefly went to school to study guitar theory and learn how to arrange horn parts for his band. Wolf was one of the first bandleaders to start withholding Social Security and unemployment insurance from his band employees' salaries, guaranteeing them at least some money in retirement or in unemployment. Wolf was a stickler for paying his employees on time and in full. 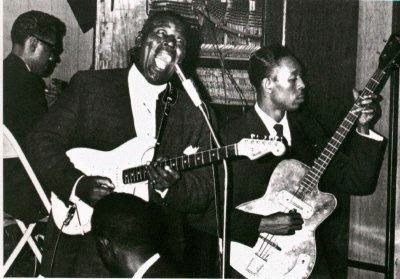 As Wolf was always fond of reminding people, especially fellow label mate, blues legend and close "frenemy" Muddy Waters, he was already a star before arriving in Chicago. Unlike Muddy Waters Wolf tried to keep the Chess Brothers at arms' distance. He refused to be paid in Cadillacs. He wanted his money. 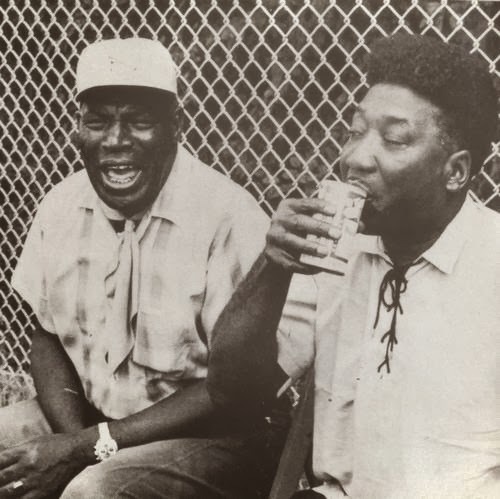 Muddy Waters and Howling Wolf were the premier Chicago post war bluesmen. They did not mind stealing each other's gigs, musicians or occasionally songs. They occasionally assisted each other as well. 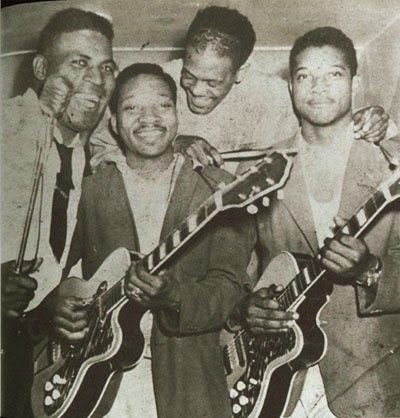 Wolf's early Memphis music featured musicians like Willie Johnson, Pat Hare, and Ike Turner(who also played piano), all of whom were fond of a raw distorted guitar sound. The Memphis sides are the beginnings of rock-n-roll. "House Rocking Boogie" and "Just My Kind", with Willie Johnson on guitar, show this. The early work is not necessarily what we might consider today to be well recorded but occasionally that works better I think. What is a true aural performance? Today we have multi-track recordings, the ability to easily fix vocal or instrumental mistakes in the mix, multiple channels and microphones dedicated to each instrument and other modern advances that make the producer more important. But sometimes it's good to put one microphone in front of the singer and have one or two room microphones for everyone else. That might be closer to what we'd really hear in a concert. Much of Wolf's music swings and swings hard. Although Wolf was not a jazz musician, there's little difference between some of Wolf's more relaxed cuts and some bluesy jazz from the forties and fifties. In other cases Wolf was playing funk music before it was called that. He influenced the next generation. For example Funkadelic's "Music For My Mother" has Howling Wolf's fingerprints all over it, right down to a (false) harmonica solo and a not so humorous reference to a town named "Keep Running, Mississippi". Much of Wolf's late fifties and early sixties output was overseen, produced and occasionally written by blues bassist, songwriter and producer extraordinaire Willie Dixon. This wasn't necessarily Wolf's idea. Dixon and Wolf weren't the best of friends. 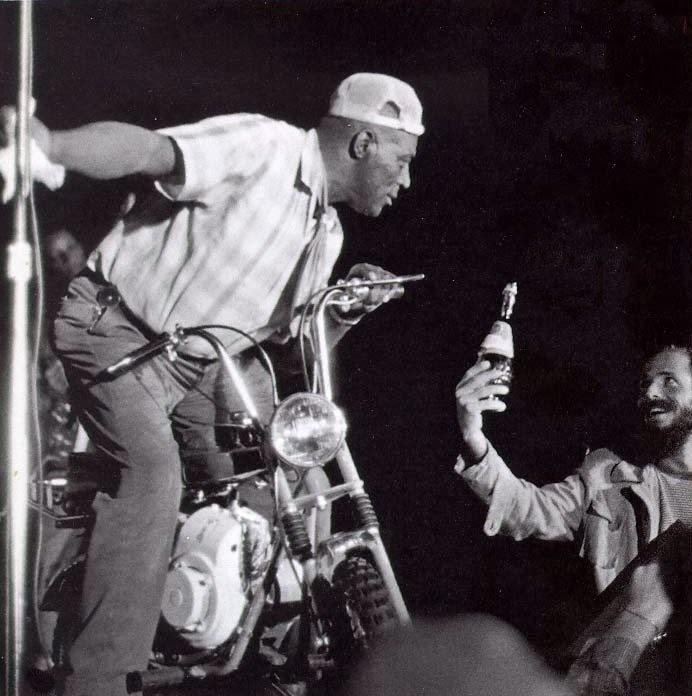 Wolf would occasionally opine that Dixon's lyrics and music were too simplistic, too personally identifiable with Dixon, and too sexual while Dixon often said the best way to get Wolf to do a song was to claim that Muddy Waters was thinking of recording it. Wolf thought that some Dixon written "big man" songs like "Built for Comfort" were silly. Wolf was also suspicious that Dixon was too close to the label owners, the Chess Brothers. Listen to Wolf and Dixon share verses on "Going Down Slow". Dale Hawkins' hit Suzie Q was inspired by Wolf in general and by his song "Smokestack Lightning" in particular. It's both ironic and possibly fitting that Wolf's classic stream of consciousness song "Smokestack Lightning " is being used for Viagra commercials. The ominous song "No Place to Go" and its close relative "How Many More Years" each define existential dread and mystery."Mr. Airplane Man" uses the same melody found in "Smokestack Lightning". "Evil" reminds me of Louis Jordan's similar musings on domestic relationships. "My Mind Is Rambling" has a delicate tricky beat. When I hear that song I always think of a bull dancing in a china shop and not breaking a single item. Drummer and Army veteran Earl Phillips had one leg shorter than the other which could be what caused him to place extra emphasis on the "one" of the bass drum's beat. You can hear this most famously in songs like "I'll Be around" and especially "Forty Four". I can't decide whether "I'll Be around" is a classic stalker song, someone begging his woman to change her mind, or a warning from beyond the grave. It could be all of those. Anyway I'll be Around" is a great song with MASSIVE distortion via overdriven amps, microphones and recording board. When Wolf starts playing harmonica it's as if the speakers are going to explode. Wolf's voice is like something from another dimension here. It's scary. "Do The Do" gives a nod to Bo Diddley with its tom-tom heavy rumba riff and avoidance of cymbals. Wolf earnestly explains just what sort of woman he likes and why. ("34 bust, 22 waist, everything else right in place") . "Spoonful" is a song about how small things matter. "Moving" was recorded near the end of Wolf's life while he was suffering from kidney and heart disease and finally cancer. You can hear someone (Eddie Shaw?) feeding Wolf the lyrics. But as Wolf boasts, his name still rings everywhere he goes. "Hidden Charms" sees Hubert Sumlin reel off an extended inventive solo that shows why he was considered to be Wolf's definitive guitarist. "Commit a Crime" is a sinister one chord vamp. It bemoans a murderous woman. Wolf tries to survive long enough to leave. "I Ain't Superstitious" is another Dixon written tune that combines Dixon's favored stop time rhythms with lists of African-American superstitions. But on "Just Like I Treat You" Wolf is not paranoid and hassled but very happy. The insistent song with a locomotive rhythm is a hymm to male female domestic equality. Wolf knows his wife will return his treatment of her for good or bad. And he wouldn't have it any other way. "Howling For My Darling", "Ooh Baby (Hold me)" and "You'll Be Mine" all express frank appreciation for life's female principle. In "Shake For Me" Wolf explains to a woman who rejected him that she returned a little too late because he's found a woman who shakes like jelly on a plate. It's a blues song but with something close to an Afro-Latin beat. A brokenhearted Wolf begs his woman for an explanation in "Tell Me What I've Done". "Killing Floor" is a famous song that was later "redone" by Led Zeppelin as "The Lemon Song" without proper credit. Wolf plays slide on "Down in the Bottom" which has the same theme as "Back Door Man": Wolf as a Lothario who must depart before his girlfriend's husband returns. "Sitting on Top of the World" is a classic traditional blues that Wolf probably learned from Charley Patton. Long Distance Call (w/Muddy Waters and Bo Diddley) is actually Moaning at Midnight". It is from a late sixties session featuring Howling Wolf, Bo Diddley and Muddy Waters. The version of Little Red Rooster with Wolf on acoustic slide is quite pretty. If you're unfamiliar with this music I think you missed something. Songs that Wolf wrote or performed are blues or blues-rock standards. Howling Wolf was a giant of American music. Although the tone and sound of Tuvan Throat singing has some surface similarity to what Howling Wolf was doing it is completely unrelated and is actually musically something quite different. All the same some blues and other musicians have been fascinated by this sound and have performed with Tuvan style singers. After all humans are brothers and sisters once you get down to it and if you search for a while you can probably find something in common with anyone, no matter how small. What throat singing does is allow the singer to create more than one pitch at the same time. There is the fundamental pitch and then the overtones. Effectively throat singing allows the singer to become a virtual human bagpipe. In males especially it can come across as a distorted growl with almost electronic sounds that are something akin to a Moog synthesizer. This is most definitely an acquired taste but I happen to have it. 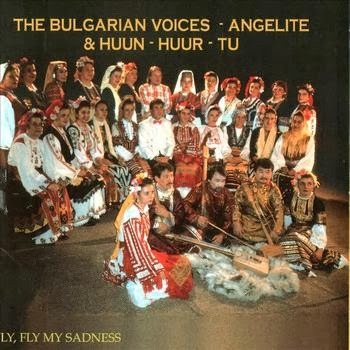 The best stuff to listen to if you are curious about this music is the release "Fly Fly My Sadness" which features the Tuvan throat singer group Huun-Huur working with the female Bulgarian chorale group Angelite. The two music styles fit pretty well together I think. This for me anyway is trance music. It's something you can listen to when you're just reclining in a dark room with your eyes closed and meditating. It's repetitive. It's most definitely not for dancing, or at least not any sort of dancing I would be familiar with. Maybe you could do some sort of odd (to me) interpretive modern dance to the music. Maybe in Siberia and portions of Central Asia this is considered dance music. Dunno. But I doubt it. Although obviously I don't understand any of the lyrics, just like with opera or salsa or various other musics in languages I don't speak, the feeling of the music transcends language. At least for me. As mentioned this isn't for everyone. Nothing is. Some people I know find this music about as relaxing as listening to a broken garbage disposal that won't stop running or a belching contest. So YMMV. All that said though check it out if you want to hear something completely different.